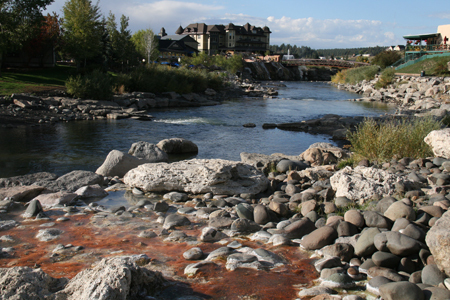 If you want to relax and rejuvenate, Pagosa Springs Resort and Spa is the place. You’ll be surrounded by the natural beauty of the Rocky Mountains and the clear blue skies of southern Colorado. Even the drive to Pagosa Springs is scenic and relaxing. The resort is set on the banks of the San Juan River with a handy foot bridge taking you to the quaint shops and restaurants of this lovely mountain town. It’s easy to find and in the center of everything. 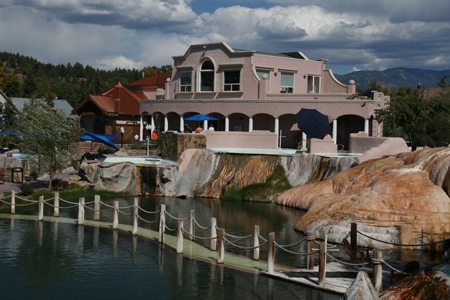 The real attraction at the Pagosa Springs Resort and Spa (The Springs) is the natural hot springs. Fed by the deepest natural hot springs in the world, the outdoor soaking pools are terraced and overlook the San Juan River. 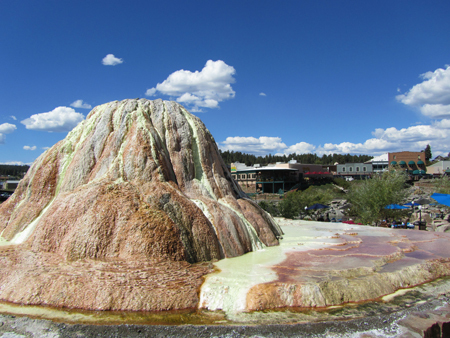 The Springs offers numerous hot pools to choose from. Multiple temperatures, ranging from 83 to 114 degrees F. (27-46 C.), ensure you will find the right comfort level. There are pools for watching the sunset, pools with waterfalls and pools reached by an underwater bridge through a natural mineral pond (the kids love that one). Every pool offers a different experience and visitors need to stay several days so they can try them all. Five pools are designated as Adults Only, however, the resort has a non-mineral, family-friendly swimming pool, a fresh water Jacuzzi, and 16 soaking pools for the children to enjoy. You can purchase a day pass to the pools but visitors staying at the resort will get the full benefit of the pools – longer hours, more relaxed access. You’ll be going to the pools right out your door in a fluffy robe. It doesn’t get any better than this! Adding to the ambiance is the natural mineral formations throughout the resort which remind you that you are in a geothermal hot springs-fed resort. You can top off your day at the Adults Only pool and then sit around the fire pit as the sun sets in the west. In the morning, or when it is chilly out, steam rises from the pools making the area look other-worldly. One morning I awoke to see a sunrise, leaves turning fall yellow and the steam rising from the pools. The river rushed through this beautiful picture postcard setting. Oh yes, some will say there is a sulfur smell. Yes there is, but it is often faint. I didn’t seem to be bothered by it. 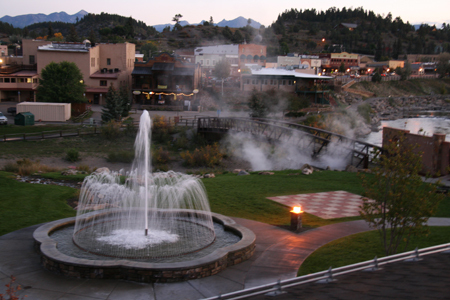 The Pagosa Hot Springs Resort and Spa (The Springs) has basic motel type rooms as well as a newer luxury building which is known for being the first hotel in Colorado built to the LEED Gold Standard. Everything about the hotel is Eco-friendly. 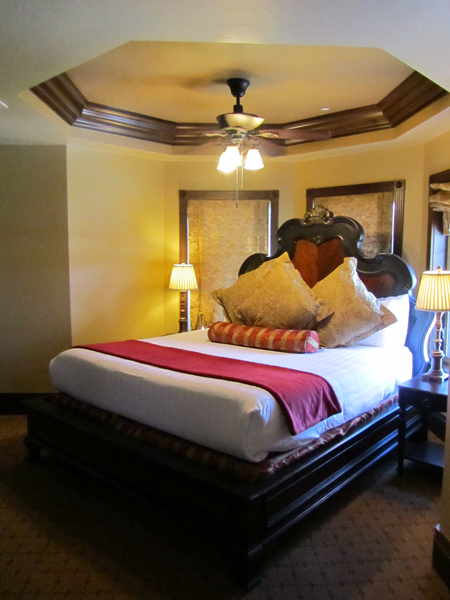 The Springs Resort hotel offers 50 rooms from Standard, Deluxe, Grande and Suite accommodations. The new hotel building is decorated in rich dark “clubby” tones. The amazing lobby is anchored by a bar with friendly bartender who is there to add to the club atmosphere in the evenings. I had the pleasure of staying in the “O” suite… named after Oprah Winfrey, who had visited the resort and the beautiful town of Pagosa Springs. This would be a great suite for a star like Oprah, a family reunion or a honeymoon. Within a few steps I could enjoy any one of the terraced tubs, watch the river go by and finish my day with a glass of wine in the lobby. While all this luxury was enticing, I did notice that budget minded travelers could enjoy a standard room with all the access to the mineral water tubs and grounds that I experienced. I heard, also that certain standard rooms were dog-friendly! 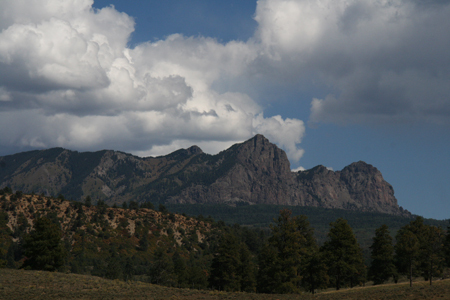 I’ll be writing an article about all the outdoor recreation and things to do in Pagosa itself. But from The Springs Resort you’ll enjoy the hot springs pools, play chess on the lawn with huge chess pieces (a la those seen in European towns), walk across the bridge for coffee or a sundown cerveza, and exercise on the riverside trail. In September I saw fly fishermen patiently waiting to catch trout as the river ran through town. The resort also has a spa (unreviewed). Right across the bridge you will find two great places to eat. For lunch or dinner, with a great view of the resort and river, enjoy Mexican food on the wrap-around deck at Tequila’s. A fantastic place for breakfast, lunch or coffee is the River Pointe Coffee Café. They serve much more variety than the usual coffee shop. Try the Chicken Curry salad wrap. The closest airport is Durango, about an hour away. Some people fly in to Albuquerque and drive approximately four and a half hours to the mountain resort. For General Aviation pilots, there is a good airport in Pagosa Springs, Stevens Field/Archuleta County Airport (KPSO).